i. 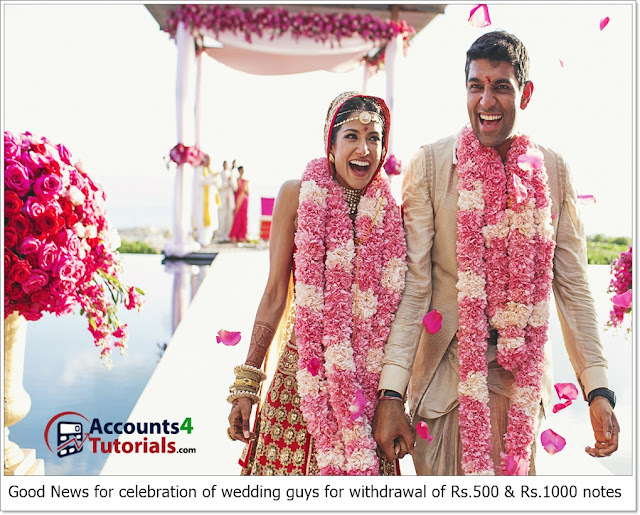 A maximum of Rs.250000/- is allowed to be withdrawn from the bank deposit accounts till December 30, 2016 out of the balances at credit in the account as at close of business on November 08, 2016. 3. Banks shall keep a proper record of the evidence and produce them for verification by the authorities in case of need. The scheme will be reviewed based on authenticity/ bona fide use thereof. Regional Rural Banks / Urban Co-operative Banks / State Co-operative Banks. A detailed list of persons to whom the cash withdrawn is proposed to be paid, together with a declaration from such persons that they do not have a bank account, where the amount proposed to be paid is Rs.10,000/- or more. The list should indicate the purpose for which the proposed payments are being made.